See below all the activities involving Sonia Chiambretto in the frame of Fabulamundi. Sonia Chiambretto lives in Marseille, France. She is a poet, playwright and performance artist. She collects stories about border crossings resulting from war and exile. Using different points of view, she combines original texts and existing documents to produce « foreign » french languages. Her work is a meeting between the words of others and her own personal experience — what she calls « objective fiction ». Hertexts are published by Actes Sud-Papiers (Chto, interdit aux moins de quinze ans, Mon képi blanc, Douze sœurs slovaques, Zone Éducation Prioritaire and Une petite randonnée (PR) and by grmx éditions (POLICES !). Her last book ÉTAT CIVIL was published by Nous publishers. 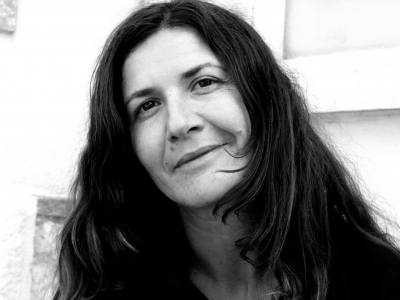 She has been a member of the editorial board of the poetry magazine Grumeaux, and contributed in several poetry magazines (If, Nioques, Action Poétique, Espace(s)). She often reads or perform her texts in theatre or museums (Actoral in Marseille, Grand-Palais in Paris, La Colline in Paris, Centre Pompidou in Paris and Metz, La Briqueterie in Vitry-sur-Seine, la Bellone in Bruxelles, the museum of contemporary art – Castello di Rivoli- in Turin, etc.). Her texts have been read and staged in France (Festival d’Avignon, Biennale de Lyon, Théâtre de la Ville – Paris, Théâtre de la Criée – Marseille, Théâtre National de Bretagne – Rennes, Festival La Moussond’été …) as well as in Belgium, Switzerland, Germany, Italy, Serbia, etc, by directors and choregraphers as Hubert Colas, RachidOuramdane, the Ildi ! eldi Cie, Michel Didym, Kitsou Dubois, BenoîtBradel, Michel Bernard, Alexandra Badea, Thibault Rossigneux. She collaborates regularly with saxophonist RaphaëlImbert. Since 2011, she has been teaching in a program of Creative Writing at Aix-Marseille University. The story started with the poetical description of a war scene in Agamemnon, a text I read to a young Chechen girl I had met in Marseille in a French language school. She has arrived in Europe from Chechnya. She was 18 and escaping from the war. I asked her to talk about her trip, I recorded her story. Experiences of the language: 1 She tells about her trip in the language of her host country, France. She still can’t speak this language very well. 2 A few months later she tells me the same story again (her trip). She can speak her new language a bit better. How does language evolve and influence memory? 3 She tells me the same story in her own language (Chechen). When she talks in the microphone she knows I can’t understand her. How far can the testimony go? Two teenagers, Kate and Bone, take us on a commented tour of their high school classified as Priority Education Zone.The geometry of space is reinvented by signs (visual notations) which assimilate the school to a labyrinth, a prison. The language moves in zigzags, as if Sonia Chiambretto was inventing a “choral slam”, a new identity-based language. A way of saying the imprisonment of bodies, the unity of space and time, through a deconstruction of language. At the boundaries of log book, child diary and political column, the narrative poem “POLICES !” introduces itself like a patchwork of disparates documents about public authorities (in general) and its methods of repression (in particular) : prisoners personal effects lists, court’s hearings descriptions, Papon’s trial archives, police reports, exercises for fighting against tear gas, a child perception of a police search… Gathered meticulously by the author Sonia Chiambretto, these textual elements, once put together, constitute a poetical question mark about the notions of justice and law applications.